Ever Leon still grapples with the sense of loss. It was spring 2007. Leon, then a senior at Santa Clara University, had been offered a full ride to a prestigious graduate school in the Midwest. But the school rescinded Leon’s acceptance after he revealed he was undocumented. Around the same time, Leon lost his father to liver cancer. “I think that losing things is a universal thing that we all go through,” said the 31-year-old Mountain View resident. “But we cannot just stay in that moment of loss. 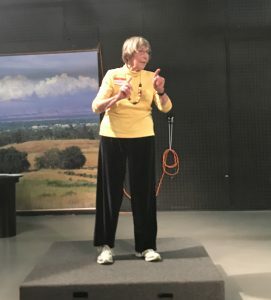 You have to keep going with your life.”Leon and four other “Dreamers” — immigrants who were brought to this country illegally as children— shared life lessons and stories of pain, tragedy and triumph with dozens of community members Sunday during an intimate storytelling session at the Midpeninsula Community Media Center. The “Walk of DREAMers” event — the second installment of a series that launched June 2016 — was produced through the center’s “Made Into America” project, which features an array of immigration stories aimed at promoting immigrant integration. The event highlighted the uncertain futures of thousands of Dreamers across the Unites States — in particular those granted temporary deportation relief and legal work permits under the Deferred Action for Childhood Arrivals program or DACA. Many Dreamers cling on to hope that they’ll be spared, pointing to their academic achievements and their potential to greatly contribute to the U.S. economy. Others, however, feel their hopes dwindling, particularly following the arrests of several Dreamers in recent months. 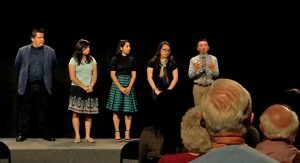 In deeply personal and poignant stories that evoked tears from the speakers and from audience members, the Dreamers shared experiences that touched on the loss of loved ones; mental health issues; poverty; discrimination and, ultimately, hope. Speakers included Sarahi Espinosa Salamanca, creator and CEO of DREAMer’s Roadmap, an app that provides scholarship resources to undocumented students; software engineer Orlando Piñeda; Sequoia High School student Myriam Leon; University of San Francisco doctoral student Lilliana Campos and Leon, now a middle school teacher at St. Martin of Tours School in San Jose. “Everyone always said, ‘don’t worry, this program is always going to be around,’” said Piñeda, who worries that won’t be the case. Piñeda, who spoke about his battle with depression as a student at Columbia University, said he didn’t attend his grandfather’s funeral in Mexico last week out of fear he wouldn’t be allowed back into the U.S.
Two members of President Donald Trump’s Cabinet on Sunday said Trump wouldn’t target Dreamers in his mass deportation policies, indicating that the administration has softened its stance on these young immigrants. In an ABC interview, Attorney General Jeff Sessions said, “There’s no doubt the president has sympathy for young people who were brought here at early ages,” adding that the administration’s top priority was tackling the “criminal element” of immigration. Organizations like the Federation for American Immigration Reform argue the program should be phased out because it doesn’t just benefit young immigrants. During Sunday’s event, Salamanca recalled the last time she saw her mother before her mom moved back to Mexico. Salamanca, who now resides in East Palo Alto, had decided to stay in the United States to make a life for herself. She was 16 at the time . “When (my mother) left I had no idea that I wasn’t going to see her for 10 years,” she said Sunday, through tears. Salamanca, the youngest of 11 children, didn’t know she was undocumented until she started making plans for college in her junior year of high school. School advisers told her she wouldn’t qualify for financial aid or scholarships. Though she eventually enrolled in a community college, Salamanca dropped out so she could support her parents in Mexico, after her father was diagnosed with cancer. He died in 2011. Salamanca was unable to attend his funeral because she would not have been able to return to the U.S. In 2012, Salamanca received DACA status and later graduated from Cañada College. In 2015, she received a green card. And, at 7 months pregnant, she drove to Mexico to see her mother for the first time in a decade. As she told her story, Salamanca recalled touching her mother’s hair and face to make sure the moment was real.